Today I have another fantastic polish I'm swatching on behalf of Dazzled--this is NailNation 3000 Parma Violet. I thought it looked kinda pretty in the bottle, but when I put it on, my jaw very literally dropped. Y'all, this colour! It's the most amazing shade of periwinkle, cornflower, tanzanite, perfectly blue-violet gorgeousness, AND it's holographic. Seriously, I just can not even. Parma Violet was fabulously opaque in two coats. I'm wearing three here, mostly because I was physically unable to restrain myself, but I can't swear the whole thing doesn't look a little "fuller" somehow with that third coat on there. Honestly, though, two was fine. When I held my nails up to get my first really good look at Parma Violet, I made a sound I don't even know how to type and which would probably make my husband a little jealous. I want to sing obnoxiously sappy love songs to this polish and take it on long walks in the moonlight. And also the sunlight so the holographic shimmer can do its rainbow thing. As much as I love the way these pictures came out, NailNation 3000 Parma Violet looked even better in person. And I don't even like purple that much! This shade, though, it's just all kinds of wow. And then it's holographic too?! Honestly, I never stood a chance. Many of Dazzled's polishes are currently 10-20% off. Did My Nails readers can also take an extra 10% discount with the code dmn10 through October 17th! This is so gorgeous! 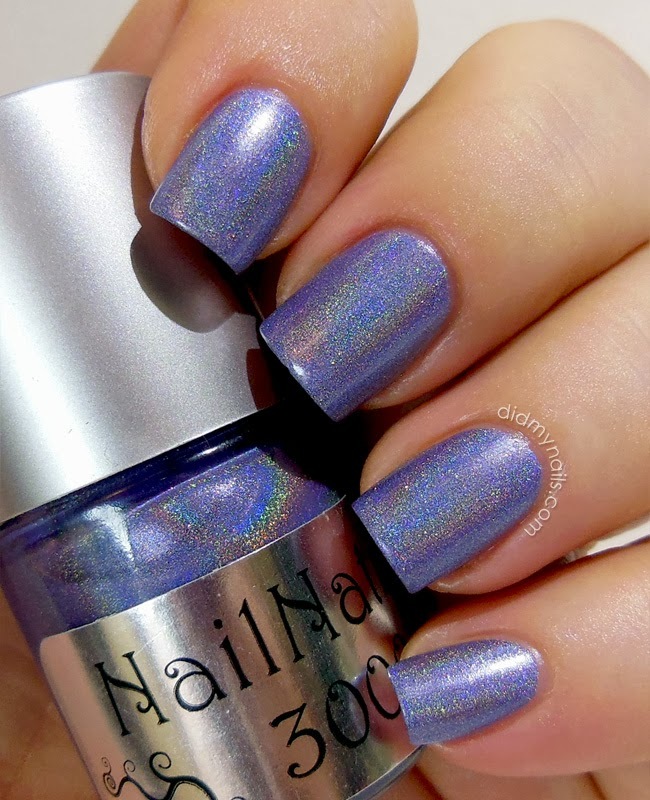 I'm a huge purple lover, and the fact that it's holo makes it that much better. This is so gorgeous!!!! I love it!! I'm loving these swatches! They make me wanna have square nails!!! LOL, I wouldn't stand a chance with this one either - it's gorgeous!! Oh my goodness :p what a lovely polish! Yep, my jaw definitely just dropped. This is gorgeous!